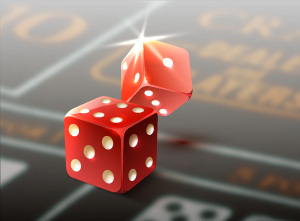 The first and most basic thing to know about craps is that it is played with two identical dice. The dice have six sides of course, with values of 1-6. The sides opposite of each other add up to seven; in other words, directly opposite the 1 is the 6. Directly opposite the 2 is the 5. And directly opposite the 3 is the 4. There are thirty-six (36) different dice combinations that can occur on one roll. Six of those combinations add up to seven (7), making 7 something of an "anchor" number since it is the one most likely to occur. Accordingly, that comes out to six combinations out of 36, a ratio of 6-to-30, and thus the odds against a seven being rolled are 5-1. Five of the combinations add up to six (6), and five of them also add up to eight (8), meaning both are 5 out of 36, a ratio of 5-to-31, translating to 6.2-1 odds against either of those totals being rolled. Four of the combinations add up to five (5), and four of them also add up to nine (9), making it 4 out of 36 combos, a ratio of 4-to-32, and 8-1 odds against a five or a nine being rolled. Three combinations add up to four (4), and likewise, three of them add up to ten (10), making either of those totals 3 out of 36, a 3-to-33 ratio, and 11-1 against either of those numbers being rolled. Two combinations add up to three (3), and it is the same for eleven (11), coming out to 2 out of 36, a 2-to-34 ratio, and 17-1 against the three being rolled or the eleven being rolled. Only one combination adds up to two (2), and only one adds up to twelve (12). For each of them, it's one out of 36, and thusly it translates to 35-1 odds against. The odds of rolling a 7 before a 6 is rolled is 5-6 (representing the number of 7's out of the 36 possible combos against the number of 6's in the 36 combos). The odds of rolling a 6 before a 7 is rolled is 6-5. The odds of rolling a five before a 7 is 6-4, or more accurately expressed, 3-2. The odds of rolling a four before a 7 are 2-1. The odds of rolling a 3 before a 7 are 3-1. And the odds of rolling a 2 before a 7 is rolled are 6-1. These numbers will all become more important as you learn more about the way craps is played and the most common bets that are available. One thing that must be remembered is that the odds of any number being rolled, independently or in relation to each other, do not necessarily represent what the payoff is going to be on the corresponding bet. Of course, it wouldn't, or there would be no such thing as the "house," would there?